A portrait of the first Reveille that was commissioned by students and faculty in 1943 has gone missing. A portrait of the first Reveille that was commissioned by students and faculty in 1943 has been found. David Chapman easily can recall how a clapper stolen from the Liberty Bell hanging inside the Academic Building made its way back to Texas A&M years ago. The bell was a replica given by Texas Gov. Allan Shivers after World War II because "no one suffered more than the Aggies." The theft of a piece of metal suspended in the bell to make it ring was unimaginable in a culture bound by never lying, cheating or stealing. Even so, it wasn't a mystery for long. "The mother of the person who took it found it hanging in a tree in their backyard and marched it back up to campus," said Chapman, retired Texas A&M University archivist and former director at Cushing Library. An even more vexing disappearance came years later and remains a puzzle today, despite two public efforts by Chapman to track it down: It's a portrait of the first Reveille and was commissioned by students and faculty in 1943 as the mascot's health was failing. A nationally known artist living in College Station -- Marie Haines -- painted the mixed breed and it was unveiled one evening after Bonfire burned and before a dance. Documents show it was placed on display at Cushing and eventually moved to the Military Sciences Building, also known as the Trigon, until sometime in the 1990s when it vanished. It captured Chapman's attention later in the decade when he came across old negatives featuring the portrait in the university's collection of photographs and thought: "Now, that's interesting. I wonder where it could be?" "It's all murky," Chapman said Wednesday. "Supposedly it was in a dorm room being stored there while the Trigon was being repainted. Dennis Davenport came upon it and another large picture amid a bunch of junk in a storage room. He contacted the officials putting the Corps Center together and they wanted it. The thing is, we couldn't track it beyond that. One person involved has died; others retired." But, Chapman said, someone has to know where this painting is now. "It's probably hanging on someone's wall somewhere," he said. 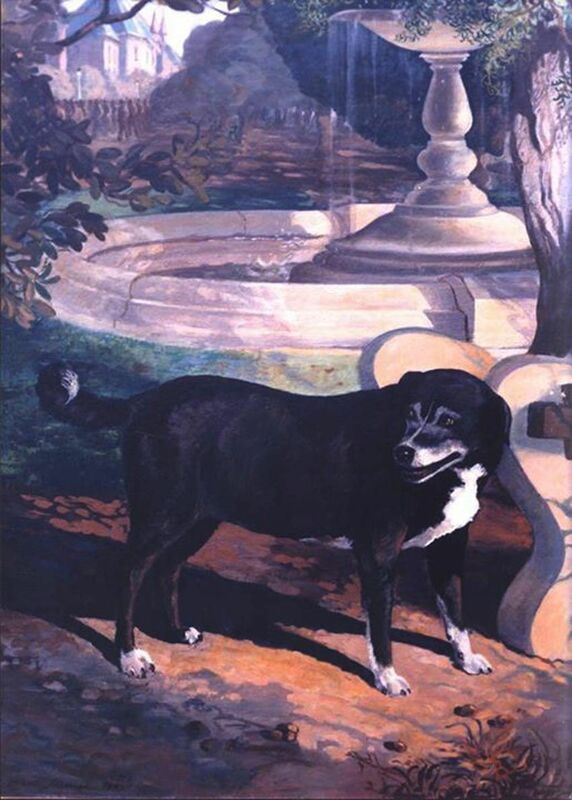 Chapman wrote about the missing painting for Texas Aggie magazine in 1999. Another attempt now is being made by the Corps Center to track it down. Lisa Kalmus, who graduated in 1993 and works at the Sam Houston Sanders Corps of Cadets Center, said no questions will be asked if it's returned. "There are a lot of different theories about where it might be, but no solid leads," Kalmus said. "We have the renderings from the artist. It must be a very large painting, so it's not like someone could have snuck it out in a purse or bag. "We'd be good with it showing up on our doorstep, like a baby. We'd just be glad it was OK. No punishment and no questions," she said, adding that publicizing her phone number -- 979-862-2862 -- and email address -- lkalmus@corps.tamu.edu -- didn't draw much in until recently. She's trying to get back in touch with a former student not long out of college. "The person just said they have some information about the painting that they needed to share," Kalmus said. "We're hoping this is it. Our big break. We hope Reveille 1 will return to our walls so everyone can enjoy her." "To understand the history of the painting, one has to go back to the late fall of 1943 in wartime Aggieland. It was obvious that A&M's much beloved mascot, Reveille, was in failing health. As a part of a wartime fundraising drive to have Reveille commissioned a general in the K-9 Division of the WAGS, members of the General Reveille Fund Committee decided to raise additional funds to have a portrait made of the aging mascot as a tribute to her memory. "The committee placed collection boxes around the campus and students and faculty alike donated what money they could to help fund the project. Hard earned nickels, dimes and quarters rattled into the boxes. Money was not plentiful on campus in 1943 and even a small donation by a student really meant something. The committee commissioned Marie Haines, a well known artist then living in College Station to undertake the painting. Miss Haines had lived in the area for 15 years and her work ranged from family portraits to murals in theaters and schools. Haines was an Ohio native with a national reputation. She was a charter member of the Southern States Art League. She had held exhibits of her work in Cincinnati, Taos and Charleston. According to the Battalion, the committee considered itself fortunate to be able to acquire her services. "On the evening of November 24, 1943, immediately after bonfire and before the Thanksgiving dance, a crowd gathered around the bandstand in Sbisa Hall to witness the presentation ceremony. With an ailing Rev looking on, acting president Frank. C. Bolton unveiled the completed work. In a short speech, Haines described the painting showing Reveille at what she considered "the most beautiful time of day" in Aggieland -- "retreat." In the background of the painting is the Class of 1938 Memorial Fountain and the Corps marching down Military Walk toward Sbisa.